Every so often a new show hits Broadway with lights that shine brighter than the rest. In 1996, Rent celebrated a group of impoverished East Village artists struggling to thrive in the shadow of AIDS. In 2003, Wicked imagined the lives of the witches of Oz before Dorothy’s unexpected arrival. But who would have thought today’s hottest ticket would be a rap-driven bio of the Founding Father responsible for the financial system that collects those taxes we all hate? This week’s story is a bit different from our usual perspective. But stick with it . . . how often do you see taxes and finance starring in popular culture? Hamilton began by chance when the show’s creator, Tony award-winner Lin-Manuel Miranda, picked up Ron Chernow’s landmark biography of Alexander Hamilton to read on vacation. Miranda saw “the $10 founding father/without a father” as the embodiment of hip-hop: a penniless immigrant who rose to power through the power of his words. The show began life as a concept album before morphing into a full-blown musical which debuted on Broadway in August. The show sold $30 million worth of tickets before it even opened, and prime seats currently command over $1,300. Miranda’s propulsive score will satisfy everyone who’s waited for hip-hop to meet harpsichords and fall in love. It combines traditional Broadway influences from Gilbert & Sullivan and Stephen Sondheim to contemporary sounds like the rapper Notorious B.I.G. As it turns out, there are only a couple of direct references to taxes. At one point Thomas Jefferson snarls, “Look, when Britain taxed our tea, we got frisky/Imagine what gon’ happen when you try to tax our whiskey.” But that line appears in a song titled “Cabinet Battle #1” that turns Hamilton’s plan to finance the U.S. government into a rap battle. (It’s not the sort of thing you expect to hear on Broadway, right?) 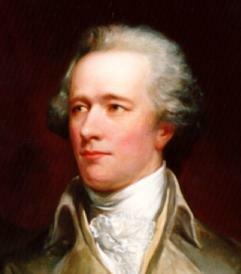 Hamilton championed a strong federal government, with implied powers to assume states’ debts, and establish a national bank. His forceful advocacy is arguably why the bulk of our taxes today go to Uncle Sam and not your state or local government. We realize that when the curtain rises on April 15, you probably aren’t humming show tunes. But it’s worth remembering, at least occasionally, that taxes really are the price we pay for civilization. And while our current tax code may seem as illegitimately-conceived as the Founding Father who paved its way, it’s the product of a uniquely American experiment in self-government that seems to still be working 200 years later.